An assassination attempt was occurred on our Pakistan's famous & a Prominent religious scholar Mufti Taqi Usmani by two unknown accused who were in pillion riding on a Motorcycle. In a said brutal incident of attempt of assassination of Mufti Taqi Usmani belongs to Deoband sect, no of two un identified accused who were opened the fire upon his car belonging to Mufti Taqi Usmani at near Nipa Chowrangi Karachi with the serious intention to kill Mufti Taqi Usmani but by blessed of ALLAH Mufti Taqi Usmani's life became safe but unfortunately in said attack Mufti Taqi Usmani's two life guards in which one is belonging to Sindh Police Department's Police Constable namley Muhammad Farooq & other one belongs to private company. 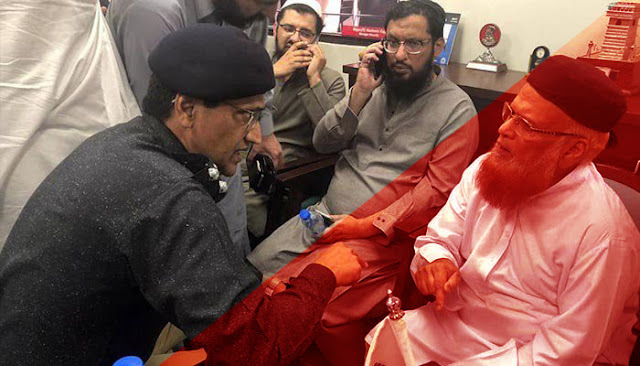 Additional Police Chief of Sindh Police Department Mr. Dr. Ameer Sheikh breifed to the media reported regarding said incident in which he told that Mufti Taqi Usmani his wife were one of the cars directly targeted by the attackers but by the blessed of ALLAH Mufti Taqi Usmani completely unhurt and became safe in said attempt of assassination.